After a four-game slate that saw some slower teams and late injury news with Mike Conley, we get a full run of Tuesday action. There's already a bunch of injury news out there that will help open up some value. And there are a few quality, upper-tier payoffs as well. 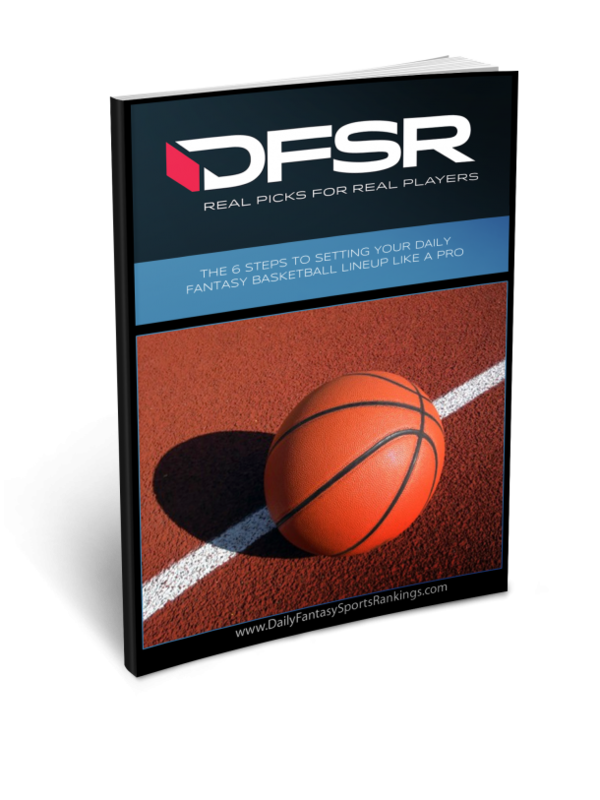 Head on over a for your chance to get DFSR PRO, which will give you access to our NBA FanDuel and DraftKings optimizer, our MLB Optimizer in time for Opening Day, and our new player lab! 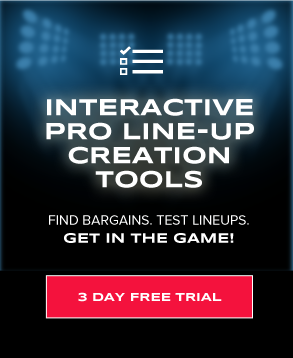 Get started for free by clicking the button below. Kyrie Irving has already been ruled out for rest for the Celtics and that should once again leave the starting point guard duties to Rozier. Now, a word of caution: Rozier will get the start, but that doesn’t always mean he plays outsized minutes. He caps out at around 32 minutes with Kyrie out but does see a tick up in usage and assists. He isn’t a must play at these prices, but he’s for sure a good one against a very weak Cleveland team. I prefer the FanDuel price to his DraftKings salary for sure. The Bulls released some injury news way early and we know they’ll be without 60% of their starting lineup in Kris Dunn, Zach Lavine an Otto Porter. With them go a lot of minutes, a lot of usage and almost any semblance the Bulls had of an NBA-viable roster. But that should leave a ton (like maybe close to the whole game) of run for these two guards. Harrison has been starting for Otto Porter in the short term and is coming off back-to-back games in which he player 39 minutes in each. Harrison is a PG in eligibility really only, playing more of the two and three with the Bulls this season. He’s almost for sure a chalk play considering the price and opportunity. And then there’s Arcidiacono who could also run major minutes at the point. He played 32 minutes against the Lakers when Zach Lavine sat. With the Bulls without Dunn as well, they only have so many places to turn. While Arci isn’t the most fantasy prolific scorer, the expected run should more than make up for any concerns about his usage rate. Stacking both of these guys together on FanDuel could easily the play in an effort to pay up at other positions. There is the potential to have a ton of cheap value coming into this slate, specifically with the Bulls’ situation (which we’ll get to more in a second) and the Celtics without Kyrie Irving. Those are just two of the teams with a lot of minutes and usage opening up for some of the cheaper plays. It means we’ll need to find spot to reliably pay up. Beal represents just such an opportunity. The guy is making the fantasy (and real basketball) leap this season without John Wall. Over the last month, he’s putting up 20 shots per game and a 27 point, seven assist, six rebound line while also piling on the steals (two per game). Dude is also running close to 39 minutes per game, among the highest you’ll see in the league on a game-to-game basis. He’ll take on the sieve-like Lakers’ defense and this game’s high total is warranted. Beal makes for a safer cash play even in this price tier. With Kyrie out, Rozier isn’t the only one to see an immediate boost in usage rate and minutes. Smart should see more as well and gets roughly a 12% bump in usage when Irving is off the court. In fact, in the last three games without Irving, Smart has double-digit shot attempts on the season in two of them. He’ll still start, making the minutes a bit safer and not as much at the whim of the Celtics’ rotations. Brown is a bit more at the whim of how Brad Stevens sees things shaking out. If Jayson Tatum were to sit again, then I’d feel a bit better about Brown here. That being said, he’s been a popular DFS play in the past with Irving off the court. It’s because Brown sees somewhere around an 8% usage bump and 12% assist spike when Kyrie isn’t around. Some of that represents Brown’s second-team facilitation role even in games Irving plays. But the minutes should tick up as well here. Considering the price, he’s a bit more of a GPP play, but you might see some folks take a stab at him in cash. Much like what I said with Bradley Beal, there are so many value plays coming into this slate that we are going to have to find ways to round out the salaries somewhere. After a few games of *managing minutes* the Lakers have ramped Lebron’s run up to earlier season rates and he’s played an average of 36 in the last three games. He’s also put up vintage Lebron lines with an average of 29 points, 11 assists and nine rebounds in that stretch. If we aren’t concerned with the minutes then we can’t worry at all about the matchup here either. The Wizards play the 9th-fastest pace and the 4th-worst defense in the league. There’s a reason this game opens at the slate’s second-highest over/under (233) with a thin spread (Lakers -2). It’s to teams who play fast, have a lackadaisical approach to defense and really have nothing to play for at this point. It could lead to some big fantasy lines. This will probably (I think) round out the considerations we have for the Celtics on Tuesday. With them possibly playing without Irving and Tatum (the latter is questionable) we could see Boston needing to run some of their second unit many more minutes in starters’ roles. Hayward drew the start on Sunday for Tatum and played 34 minutes (tied for his 3rd-most of the season). He double-double (13 points, 10 rebounds) while also running a bit bad from the field (4-11). Even if Tatum played Hayward would be in line for more bench minutes and he’d be close to a cash game play even in that role considering the Cavs are such an easy matchup. Strongly consider Troy Brown (FD $3500 DK $4700) who should still be the starter for Trevor Ariza on Tuesday. I also wouldn’t mind Dwayne Bacon (FD $3900 DK $4000) if Nicolas Batum were to sit again. I get that it can be scary rostering Portis considering some of the disappearing acts he’s pulled even when running with the starters. But that hasn’t been the case over the last three games with the dude 38, 36 and 31 minutes. He’s used that court time to average 16 points and eight rebounds, made even more encouraging because two of those games were against the Nuggets and Heat. Now he’ll get the Lakers and their middling defense and top-four pace. It’s nearly a dream situation for Portis who isn’t priced to account for the minutes he’s playing in the short term. I’d been waiting on a volume shooting game from Kuzma in which he didn’t run epically bad from the field and said as much in a picks article (and podcast) last week. He finally got it against the Kings on Sunday, jacking up 22 shots including 5-14 from three. It wasn’t ultra-efficient, but it got the job done with the sophomore forward putting up 29 points and six rebounds. At a weaker power forward position on FanDuel, the idea of 40 minute upside for Kuzma in another good DFS matchup against the Wizards has me thinking he’ll be a popular play on this slate. Strongly consider Marcus Morris (FD $5500 DK $6000) if Jayson Tatum is out again. Bryant is the staring center for the Wizards again and probably will be for the rest of the season. He’s never had an issue as a fantasy point per minute guys and the last couple of games have been no exception. He’s played 35 in each and averaged 20 points and nine rebounds. Now he’ll face a Lakers’ team allowing 10% more scoring and 11% more rebounding than league average to opposing centers. Bryant’s price is, of course, up in the short term but not enough to account for the significant increase in opportunity. Towns rounds out the “Let’s Pay Up Somewhere” group. KAT has been an absolute beast over the last month-plus with a ridiculous 31 point, 15 rebound and four assist line over the last 13 games. That’s about as good as you’ll see from anyone in the league. It’s just a shame the rest of the team is a trash pile at this point. It’s even more amazing that those averages came in less than 33 minutes per game because the T-Wolves get blown out so often (or he’s in foul trouble, or both). In games where he sees full run, dude can shatter these prices.